We clean all types of area rugs ranging from Chinese to Indian and Persian. Expert rug repair and re-fringing services are offered. The appropriate method of cleaning is best determined by the type of weave, fiber and dye used to make the rug. Prior to actual cleaning, the rugs are "machine beaten". This process eliminates dust and debris which may be embedded in the rug. It is then washed with a mild detergent, rinsed and then maneuvered through pressing rollers. Finally the rugs are allowed drying time in a controlled environment. Rugs are then individually and carefully inspected for any further detailed cleaning that may be required. All work is guaranteed! Accumulation of dust, pet odors and deposits can deteriorate the foundation of a rug over time and therefore shorten its lifespan. Pet stains and water damage should be removed immediately to minimize damage, discoloration and odor. It is recommended to have your rugs cleaned once every 2 years to maintain its beauty, vibrancy and durability. Remember, not all damage is visible at once. Discoloration occurs gradually over time and may not be noticeable for several months. So minimize risk, protect your investment and tackle any problems immediately! WE ARE OFFERING A LIMITED TIME SPECIAL UP TO 30% OFF, Get Our Special Deals And Coupons Delivered To Your Inbox. 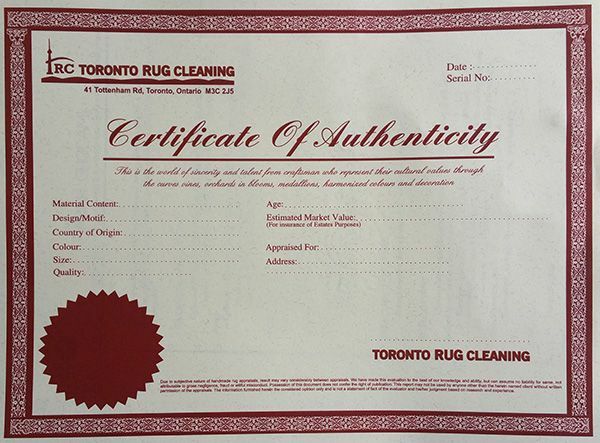 Copyright © 2006-2019 By Toronto Rug Cleaning, All Rights Reserved.